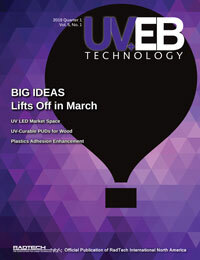 Printing Industries of America (PIA) recently released descriptions of the 14 recipients – five of which involved UV or LED technology – of the 2017 InterTech™ Technology Award. The independent panel of judges deliberated over technology nominations that showcased the dynamic and innovative nature of the industry. The judges singled out the following technologies as meeting the award criteria of being truly innovative and expected to have a major impact on the graphic communications industry. The Esko XPS Crystal is a digitally controlled UV LED exposure unit supporting photopolymer flexo plates. The unit provides an unprecedented level of automation and can be part of a completely automated platemaking line. The UV LED light technology, concurrently preforming both main and back exposures, and the digital control allow for new levels of exposure accuracy. The judges praised Eskos innovation that both streamlines flexographic platemaking steps and improves plate consistency. The Gallus Labelfire 340 is a label converting system that allows printers to produce UV inkjet-printed labels in one press pass. The press combines flexo and/or screen units with inkjet units imaging at 1200×1200 dpi native, thus facilitating variable data and versioning in label printing. Eight color labels can be printed, embellished and converted at speeds of 164 feet/minute. The judges immediately saw the impact of a hybrid press that can do it all inline at those speeds. The technology uses LED arrays that are precisely manufactured to reproduce different portions of the light spectrum. It is the first LED color viewing technology to achieve certification to the demanding ISO 3664:2009 standard. JUST hardware, software and optical technologies are integrated to achieve conformance to CIE D50 and D65 illuminants and to remain consistent over time. The judges agreed that the JUST LED moduLight product line reaches a new level of viewing performance. The Komori Impremia IS29 is a 29 UV inkjet press that can run a 23×29 sheet at speeds up to 3,000 sph. It meets customer needs of quality, reliability, substrate freedom and delivers bindery-ready sheets, thanks to the UV curing capability. Users extol its ability to print variable data while producing print quality visually indistinguishable from offset. It is the IS29s perfecting capability that caused the judges to see it as easily integrated into existing sheetfed workflows. The awards will be presented to companies before an audience of industry leaders during the 2017 PIA Premier Print Awards and InterTech Technology Awards Gala, on Sept. 10 in Chicago, Illinois. A technology review booklet showcasing all of the years entries will be distributed at PRINT 17 and with the August/September issue of Printing Industries of AmericaThe Magazine. For more information, visit www.printing.org/InterTech.